Sometimes I’ll happen across something entirely unexpected and delightful, such as this tree hung with vivid ribbons of cloth. 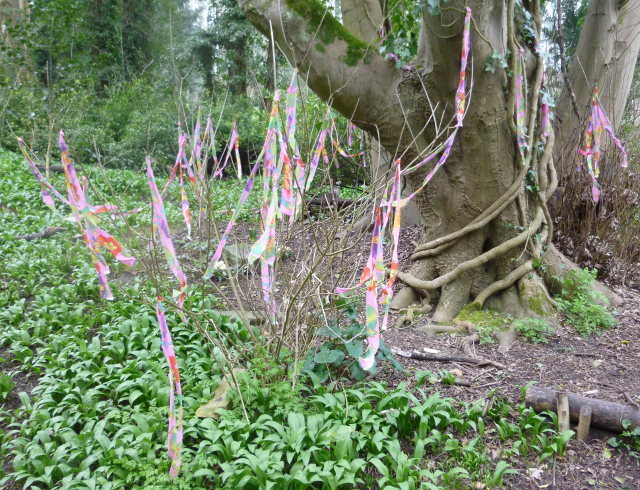 I’ve no idea what prompted someone, or perhaps a group of someones, to adorn a patch of woodland in this way. The fact the ribbons themselves seem torn from vibrant, possibly hand-dyed, fabric is even more intriguing. What ritual was carried out here? What do the ribbons symbolise? Whose garment was shredded, and why? Did they have to run home naked? Write a story from this, and send it my way!